Brain scientists face a dilemma: Conventional wire implants are rigid and can sometimes traumatize that sensitive, vital organ; but softer materials now being tested by researchers, have their own problems—they often bend or buckle and can’t be easily forced into squishy tissue inside the skull. A biomedical research team at Case Western Reserve University might have found an answer to that problem—inspired by the bothersome, buzzing, blood-sucking mosquito. And a host of neural researchers could benefit. Brain microelectrodes have a significant potential to treat people with neurological dysfunction and improve our understanding of neural circuitry. Capadona, who heads a Bio-inspired Materials for Neural Interfacing lab, said post-doctoral researcher Andrew Shoffstall came up with the idea for solving the dilemma. Shoffstall was first author on a paper explaining the technique that was published earlier this year in the journal Scientific Reports. Shoffstall said a series of circumstances—a handful of pregnant co-workers concerned with how mosquitoes spread the Zika virus—led him to a National Public Radio report showing how mosquitoes bite their human or other mammalian hosts. So they did. 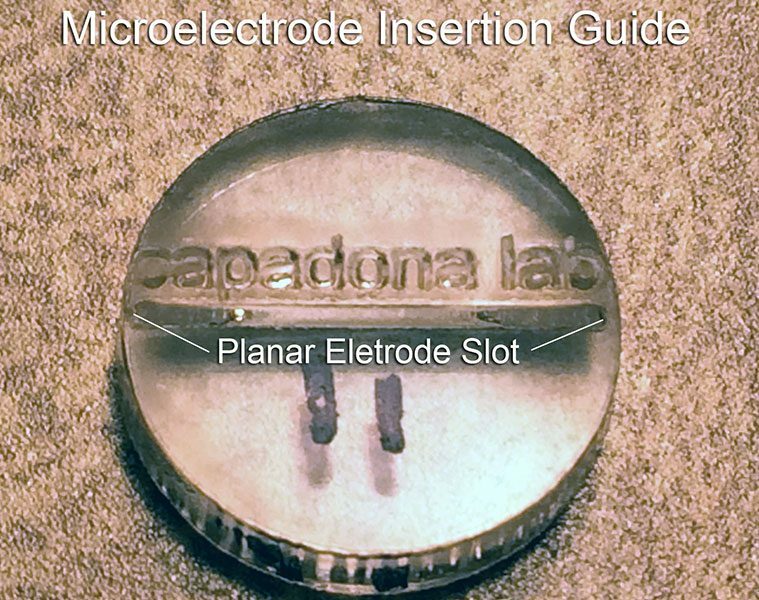 Researchers designed a prototype implant-guiding tool now being tested in the Capadona lab. They 3-D-printed the device, a small plastic disc with only a few noticeable small holes, at the Larry Sears and Sally Zlotnick Sears think[box], Case Western Reserve’s center for innovation and entrepreneurship. Shoffstall, Capadona and their team only borrowed the one process—the “guide arm” alongside the probe itself, but not the sawing or spreading of tissue—and incorporated it into the small, gray plastic tool. Side view of the neural implant guide inspired by mosquitoes. 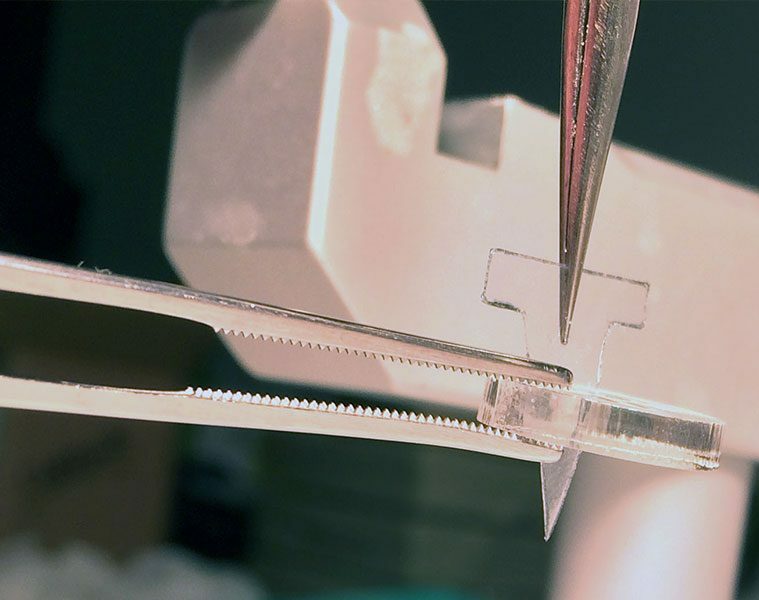 Still, what might look drab and unimpressive—even “low-tech,” Shoffstall said—is already helping researchers at Case Western Reserve insert the flexible probes safely and successfully into the brains they are studying. Capadona and Schoffstall also said the buzzing pest may have more to show them. Shoffstall, A. J., Srinivasan, S., Willis, M., Stiller, A. M., Ecker, M., Voit, W. E., ... & Capadona, J. R. (2018). A Mosquito Inspired Strategy to Implant Microprobes into the Brain. Scientific reports, 8(1), 122.